Our Sponge Cakes can be personalised online in lots of ways for birthdays, anniversaries, christenings and any many other special occasions. To make your Sponge really stand out from the crowd you could personalise it with your very own photo to create a delicious photo cake! 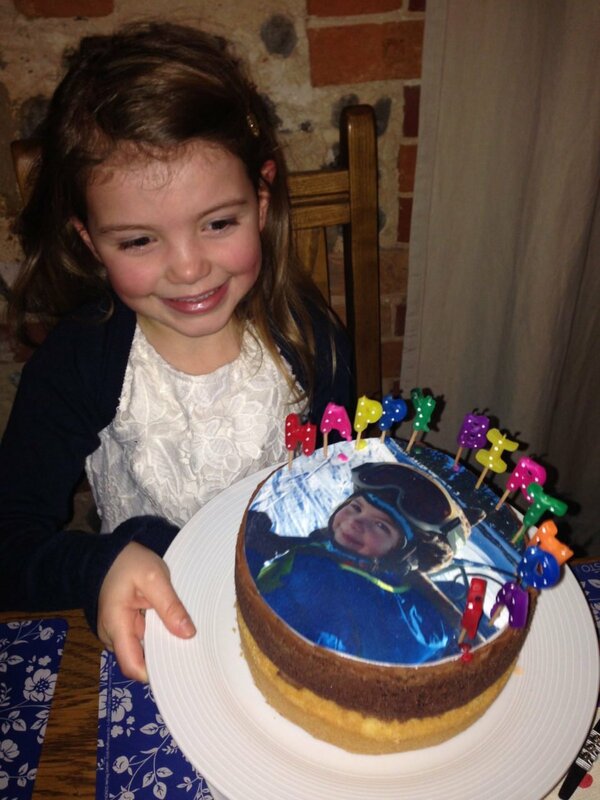 Perhaps you would like to send someone a personalised birthday cake with a photo of the two of you on – all you need to do is upload it to our site and you can even write a message on top too! If you don’t want to add a photo we also have a selection of pre-made templates you can use and then write your own personalised message on top. Or we ever have a fantastic range of pre-made toppers with messages such as Happy Birthday, New Baby Boy/Girl, Congratulations and many many more to choose from. For more information on Photo Toppers and Photo Cakes read our extensive guide here. You can choose from our selection of greeting cards online, write a personalised message inside and leave the rest to us! We have a good seleciton to choose from covering most occasions. If you really want to impress the recipient how about personalising your cake with a gift wrap. We have different themed wraps to choose from to get it just right for the occasion and make your Sponge look dapper! Is it even a birthday cake if there aren’t any candles? Choose from our fun range of candles to personliase your birthday cakes – from football candles, princess candles, happy birthday candles to giant fountain candles to really make your sponge cakes sparkle! Personalise your Sponge Cake with a pack or two of our multicoloured balloons – no kids birthdayparty should be without them! We have a great range of alcoholic and non-alcoholic drinks to add a bit of indulgence to your Sponge Cake orders. Send your loved one a mini bottle of prosecco or even a Gin and Tonic to wash their Sponge Cakes down in style! We all know that Sponge Cakes and a cup of tea are a match made in heaven so you can of course personalise your cakes with a range of different teas – but did you know we also have coffee and hot chocolate shots too? They all go really well with our cakes – give them a try! From 0-9 our acrylic numbers are the perfect addition to peronalise your loved ones birthday cake– they are even washable and re-usable. Our ‘Happy Birthday’ Acrylic Topper is a great choice for a personalised birthday cake as it is washable and resusable so can be kept in the cupboard and brought out every year!